If you don't have a miniature human skeleton in your house, stop what you're doing right now and get one. I can't tell you what a difference it makes having an actual skeleton as opposed to simply looking at a picture. So...you get the skeleton, and now what? These are the bones in your body. Phalanges connected to your metacarpals. Metacarpals connected to your carpals. Carpals connected to your radius. What next? Bone games. Kids find them hilarious. In Simon Says fashion, say "Put your phalanges on your clavicle! Put your phalanges on your patellas!" And before you know it -- BOOM -- your kid has all the bone names completely memorized with hardly any effort. To my surprise, just having the skeleton on our dining room table was inspiring. When I passed by, I found my son involved in drawing the skeleton in detail by hand. 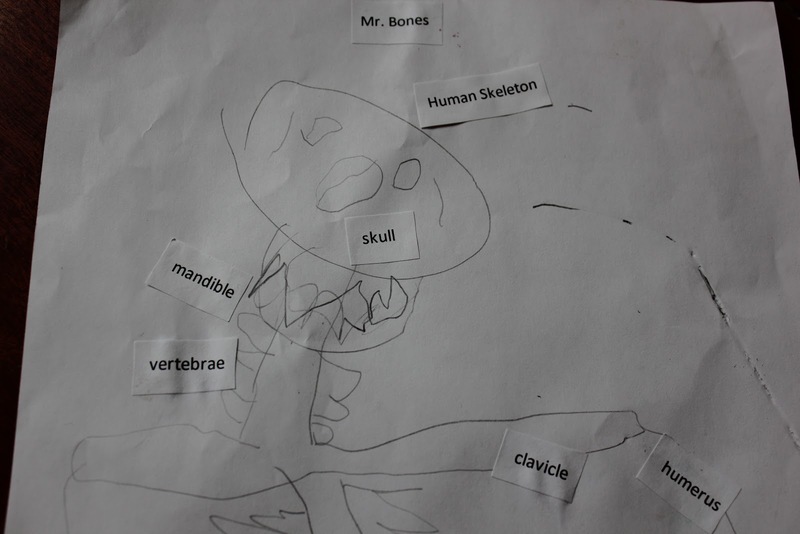 I quickly typed up the names of the bones, and he glued them onto the correct places. I think today we may try our hand at taking some easel paper and drawing around my son's body, then drawing the bones inside.